To celebrate the occasion of the 2012 Track World Championships being held in Melbourne, we teamed up with Jump Media to deliver Chasing Rainbows, a design competition based on the traditions of vintage cycling posters. The only design conditions were that all entries must contain the Event Logo, key information and distinctive championship colours rainbow. An exhibition of entries was held at FYXO Hub as part of 2012 Melbourne Bikefest. Five finalists were chosen from a strong field, and Gregory Baldwin was selected as the winner, pocketing $1000 cash and his design up in lights. 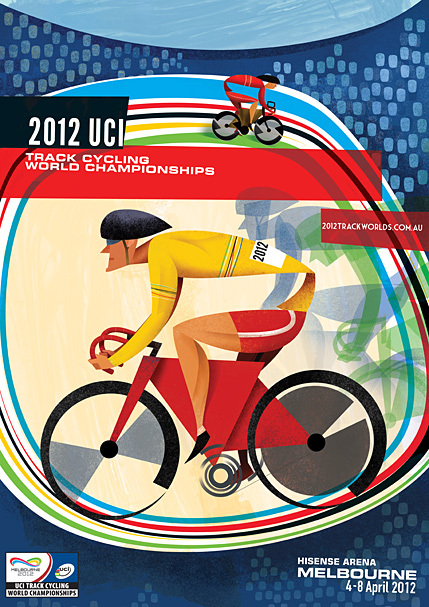 All of the finalists posters were available to purchase at the Track World Championships events as commemorative merchandise. View the finalists below.